On May 19, 2015 Children in Need Club had our annual concert. It was held on a Tuesday evening and we were thrilled to see a fairly large turnout, almost 50 people. The goal of the concert was to raise money for our upcoming Stanford Trip. A very talented graduate of San Domenico and former president of the club, Chener Yuan, returned as the star of our concert. She played multiple pieces including a Mozart sonata as well as works by Elgar, Bach, and Li. We featured a quartet playing Mozart consisting of Mirah Ray, Linda Li, Sophie Ahn, and Aurora Schünemann. Linda and Mirah also played solo works. Additionally, Chili Ekman played some solo repertoire. The concert was a great success and Children in Need is happy to announce that we reached our fundraising goal! 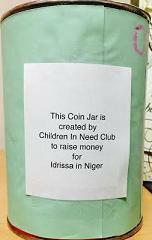 A coin jar was created to raise money for CiN sponsored child, Idrissa in Niger, the poorest country in the world. CiN started sponsoring him since 11/10' when he was 4 years old. Now he is in school and wants to be a teacher in the future. The coin jar is in Laura's office. 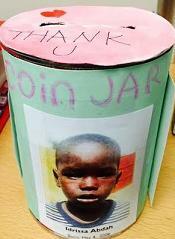 Please spare your coins and help Idrissa to continue his school education. On October 23rd and 24th, we had a bake sale in San Domenico School during school hours until 3:30pm after school. Oct 24 is the United Nation Children's Day. In corporations with this event, we were selling bookmarks that were made by Sun Village kids in Beijing. Sun Village is a place for children whose parents are in jail. With the use of Chinese paper-cutting techniques, each of these bookmarks portrays an article of the United Nations Convention on the Rights of the Child. Teachers liked the bookmarks especially and we got a lot of support from them. Fiona made the smoothie for us. Smoothis is good to sell not only because it's healthy also because we can lower down the cost by making food by ourselves rather than buying processed goods. Brownie was also made by a group of members who donated their time to help. We also got special help from Mr. Sloan to make big brownie for us since his brownie is well known in school and taste really good. During the bake sale, we also accepted IOU (I owe U) from high schoolers so that people who forgot to bring their money could still buy our stuffs. And we actually traced all the money back during the next week. We sold things after school to the middle schoolers and primary schoolers and earned some little donations from their parents and teachers too. We also sent out an email blast through Laura to the whole school containing a pdf introducing out club, what we do and everything we sell. There were 20 people in total who replied the email and we chose the 1st, 2nd, 3rd, 10th, and 20th to give them a free chance to draw. We believed that people who got the free chance would bring their friends to the bake sale and also helped us promote the bake sale. And for those people who already spent $3 or $4, a free chance to draw would encourage them to spend over $5. In this way, we increased the profit. Here we would like to thank all the people who helped out during the bake sale! This successful bake sake includes everybody's effort! In conclusion, the bake sale was very successful We earned $346 in totoal during these two days. Some of them were donated to the African boy. We also made a flyer about the bake sale with a lot of club members' signiture, we will mail this flyer to the African boy to show him our care. The other half we are planning to donate the money to SEAPC. Because there are a lot floods in Cambodia right now. Through SEAPC, they will give the money to the orphanages in Cambodia to help those Cambodian kids affected by floods now. On April 14, 2013, Children in Need held a benefit concert at HOTA in San Domenico School. The concert started at 7:00 pm while members showed up after 6:00 pm to set up the place and rehearse their pieces. Club members executed themselves professionally from reception to performance. The overall concert was filled with high spirits and enthusiasm. The concert started with Kuni’s introduction and Fiona’s short speech about the purpose of this concert. That was to raise money for the orphanage in Nepal where she would represent our club to teach art and English this summer. After the brief introduction, the concert started with Mirah's playing of a cello suite by Bach. Then the club musicians brought audience an array of classical music including pieces by Beethoven, Liszt, Sarasate, Kreisler, Kuhlau and Zili Lee. Freshman, Linda Li, performed for the first time at our club’s event. Club members are multi talented such as Amanda’s and Elena’s flute playings as well as Amanda’s piano and Elena’s violin performances. The high point of the concert was RJ’s playing of a piano piece by Franz Liszt, “Mazeppa”. His spirited performance was spectacular and impressive. Cherry’s sensational playing of a violin piece by a Chinese composer, Zili Lee, also brought a different flavor of music to people. We especially like to thank Miles Graber for contributing his time and efforts in accompanying the performers. On March 14 and 15, 2013, we had a bake sale in San Domenico High School. The aim of this bake sale was to raise money to support the sponsorship fee of the African boy in Niger and an impoverished school in Nepal. The original one day bake sale prolonged into two days as we still have snacks left from the first day. During the bake sale, we sold different kinds of Asian style snacks as well as brownies, apple juice, fresh made smoothies and lollipops. Here we would like to thank for the support from the high school faculty and high school and middle school students. We successfully raised $160.45 from the two days. We have decided to give $50 from this bake sale to the African boy and the rest will go to Asna Orpnanage in Nepal. We are having another performance at the end of March and continue to raise money for the African boy. 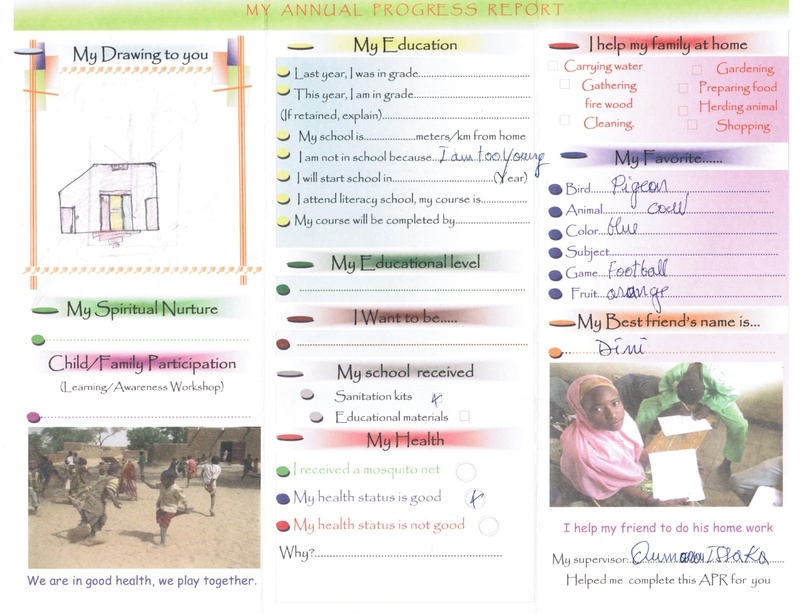 According to World Vision, children in Gamou are very pleased with our commitment for their well being and their family. Our support has helped reduce malaria cases and provide safe drinking water with the installation of four new bore wells in four villages. We also helped strengthen capacity of 167 teachers to obtain quality education for children. On Friday, December 21, Children in Need hosted its final concert for the year at San Domenico’s Peformance Hall. The club’s last concert for 2012 was intended to raise money for SEAPC - Cambodia, an organization that raises money to build schools for orphans in Cambodia. The club members were delighted to welcome Matt Gepert, a representative from SEAPC, as the concerts’ official guest of honor, as well as Caitlin Gowdy, founder of Children in Need and current club Ambassador. The concert began with a brief introductory speech by outgoing club President, Gaby Berbey. She then beckoned Mr. Gepert on stage to say a few words about the purpose of SEAPC. For anyone who attended the concert, they can attest to the fact that Mr. Geppert demonstrated the power of fulfilling one’s passion as his speech illustrated just some of the spectacular projects he has witnessed at SEAPC. Following Mr. Geppert’s introduction, club member, Tyler Leswing on piano and special guest, Randy Plummer, on saxophone, kicked off the concert with The Beatles’ beloved Hey Jude as the sound of the saxophone engulfed the hall with its deep definitive tone. RJ Pearce and Gaby Berbey then transported the audience back to the sounds of the early 1800’s with Beethoven’s Spring Sonata, capturing the elements from both the Classical and Romantic Period with musicality and fine balance. Remaining on stage, RJ Pearce then performed Liszt’s Transcendental Etude, leaving the audience on the edge of their seat with every theme, both new and recurring. Kuni Migimatsu then performed Chopin’s Ballade No. 2, catching the audience off guard with his masterful transitions between light tones and deep emotions throughout the piece. With immense grace and elegance, Hayaka Komatsu diverted the concert back towards string instrumental pieces with Shostakovich's Sonata Op.147 as she let the viola’s sonorous voice fill the hall, as well as the hearts of the audience members. Returning club member, Kenji Bellavigna introduced the light and gentle tone of the clarinet with Messager’s Solo de Councours, skillfully utilizing the clarinet’s tone to its full potential. Special guest, Alexandra Simpson, followed Kenji with Bach’s Prelude to the 3rd Suite on viola, impressing the audience with her sustained phrasing and rich sounds. Providing a different cultural and musical setting to the concert, incoming club president, Cherry Yuan then performed Zi Li Li’s The Song of Fisherman’s Harvest, adeptly capturing China’s musical and cultural features in the songs as a virtuoso. Concluding the concert, Toki Migmatsu performed both the first and second movements of Beethoven’s Sonata Opus 101, providing an exceptional aesthetically pleasing balance between musicality and technicality. The concert was followed by a lovely reception with food and beverages, courtesy of the parents. All the performers are beyond grateful for all the support we have received throughout the year, and we look forward to the concerts in store for 2013. On december 16th, I hosted a concert supporting the Raphael House, a non-profit charity organization. This organization was the first homeless shelter in SF that works w/families and children in which to "achieve stable housing and financial independence, while strengthening family bonds and personal dignity" (mission statement). I chose to support this cause because I am passionate about supporting homeless and poverty-stricken people. At first, it was difficult finding the right charity, as there are so many in need but I feel I have chosen a solid organization in the season of giving. The evening was fantastic. Over 80 guest came to support. The food was delicious and the music was great. The program consisted of a fusion of classical and jazz music. The classical musicians were Kuni Migimatsu, Kenji Bellavigna, RJ Pearce, Gaby Berbey, and Toki Migimatsu. Amy Kwon started the set w/a hearty holiday song. The jazz musicians were Randy Plummer, Cory Broad, Jason Zucker, Aaron Kats. and myself, Tyler Leswing. I was honored to host this concert and to play amongst such talented, committed musicians. We really appreciate and thank all the many donors, who gave generously to the Raphael House. At last count, we were at $3,490! I would also like to give special thanks to all the musicians that participated in this note worthy cause. On October 28, 2012, Children in Need held a benefit concert at Tamalpais Methodist Church in Mill Valley. This concert was to raise money for the uncompensated children who receive dialysis treatment at Lucile Packard Children’s Hospital at Stanford. The club’s musicians and helpers started to come to the church around 5 pm to rehearse and set up the reception table and food. There were a lot of energy and cooperation among the students despite the fact that they come from different high schools. At 6:30 pm, Joyce Kwon started the concert by giving an opening speech. Then Kuni took the piano seat and started his melodic interpretation of English Suites by Bach. Cherry also played a Bach’s Partita No.2 in D minor for violin with impeccable techniques and tone quality. Then, Cherry and Sandra together played a violin and piano duet, Sicilienne by Maria Theresia von Paradis. Following was Gabrielle’s melodious Bruch Concerto in G major. Matthew then played Beethoven Sonata Op.81 “Led Adieus” with his flawless musicality. A new club member, Nayvin, also a member of San Francisco Youth Orchestra, played a soulful violin piece by Bach with a beautiful tune. Then, a gifted piano player Sandra played Brahms Rhapsody in G minor, wonderfully and gracefully. Cherry, once again, took the stage and enchanted the audience with her Kreisler’s Recitativo & Scherzo. Katarina, a virtuoso pianist, then played Mendelssohn’s Variations Serieuses Op. 51 with energy and fire. The concert ended with San Domenico Virtuoso Chamber Group played by Niki, Elena, Matthea, and Joyce. The four-girls’ energetic playing of Brahms’ C minor Quartet and “Por una Cabeza” by Carlos Gardel resonated within the church and ended the program on a high note. By the end, the concert was able to raise $500. Proceed will be sent to the Lucile Packard Foundation for Children's Health designated to the children at the Dialysis Center. After visiting these children in September, we hope our efforts could help those children financially during the long treatment process while waiting for their kidney transplants. Through this concert, Children in Need was not only able to raise money, but also able to reascertain the cooperation and the spirit among the club members. Each and every individual member is invaluable to Children in Need and the club is thankful to have such supportive and committed members working diligently for a better cause. On May 11, 2012, Children in Need members who graduated from Saint Mark’s School held a concert and reception for the eSicabazini Girl’s Scholarship Program. Held at the Saint Mark’s gym, the concert had a very good turnout, ranging from alumni, to parents and teachers. With the help of Saint Mark’s Director of Special Programs, Jenny Getz, the concert is considered a big success. It brought in over $3,000 for the Girl’s Scholarship Program. The concert started off with Gaby Berbey delivering a speech to provide information about the club, its cause, and the drive of the alumni to go back to their roots and help through their music. The first performer, Caitlin Gowdy, a graduate of 2008, played her wonderful interpretation of all five movements of Pablo de Saraste’s Carmen Fantasy. Saint Mark’s fourth graders Hunter Hulsebus and Jacob Hershman, were the special guests of the evening and performed their piano and violin pieces at very high levels. Matthew Speigel, class of 2010, then directed the theme of the performance from classical to jazz with F.W. Ferling’s Study in D Minor. This is Matthew’s last performance until he gets back from London where he will spend his third year in high school. After Matthew’s lively performance of the Study, Tyler Leswing, class of 2010, impressed the crowd with his very own unique composition entitled Shining Darkness. As usual, we enjoyed Tyler’s distinctive style and original work. Gaby Berbey, also class of 2010, took the stage with her passionate interpretation of the Bruch Violin Concerto’s 2nd movement. Everyone truly enjoyed her soulful performance. Following Gaby’s Bruch violin concerto was Toki Migimatsu, class of 2008, playing Liszt’s Transcendental Etude No.10. Again, he managed to amaze the crowd with his impeccable technical and musical talent. Hayaka Komatsu, class of 2009, concluded the performance with her beautiful rendition of Weiniawski’s Concerto No.2 in D minor Op. 22 3rd movement. Having the alumni perform not only allowed the student musicians to reconnect with the Saint Mark’s community, but it also gave them a chance to be student models and to give back to the community which provided them with endless care and support throughout their middle school years.